Many Industry 4.0 concepts, such as condition monitoring of plants or predictive maintenance, require remote access to facilities and devices. However, even modern vehicle diagnosis relies on optimum communication between service technician and vehicle. Apart from pure troubleshooting, diagnosis communication with ECUs is also used for other tasks, such as feature activation or deactivation, reprogramming (flashing) the control unit, or replacing operating software. It is therefore crucial to protect the communication between tester and control unit against misuse by unauthorized persons or test equipment. ESCRYPT’s secure (remote) diagnosis access solution ensures that access to ECUs is possible only using authorized diagnosis hardware and software. The solution is based on cryptographic key management that is precisely tailored to the demands of embedded devices. To access the protected diagnosis interface, testers need a trustworthy access token, which they must request from CycurKEYS. To do so, the tester (possibly with the help of the PKCS#11 Provider) establishes an authenticated connection to CycurKEYS. The system checks whether the tester (or their users) have the necessary authorizations to receive the access token. If the result is affirmative, CycurKEYS issues the access token and transmits it to the tester. The tester presents this token at the device/ECU, where it is verified with the help of CycurLIB/HSM, and access is granted. We ensure that only authorized diagnosis access is carried out. Managed service – we operate it for you! Our CycurKEYS product is a security software solution that creates and manages cryptographic keys, symmetric and asymmetric (PKI). PKCS#11 Provider makes integration into existing software easy and establishes the connection to CycurKEYS. Access to the smartcard occurs transparently. Existing solutions are easily adapted. 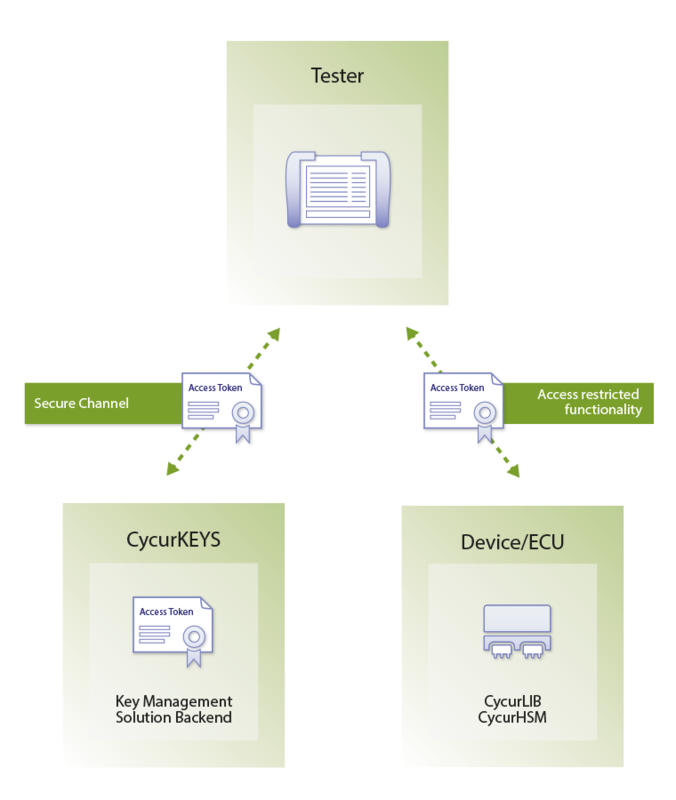 CycurLIB checks the access token in software; our CycurHSM security stack for hardware security modules checks the authorizations in hardware.